Preheat oven to 350 degrees (375 for high altitude, as I am). Line the bottom of a 9 X 13 baking pan with parchment paper; spray pan with cooking spray. In large bowl, use electric mixer to beat sugar and oil until well combined. 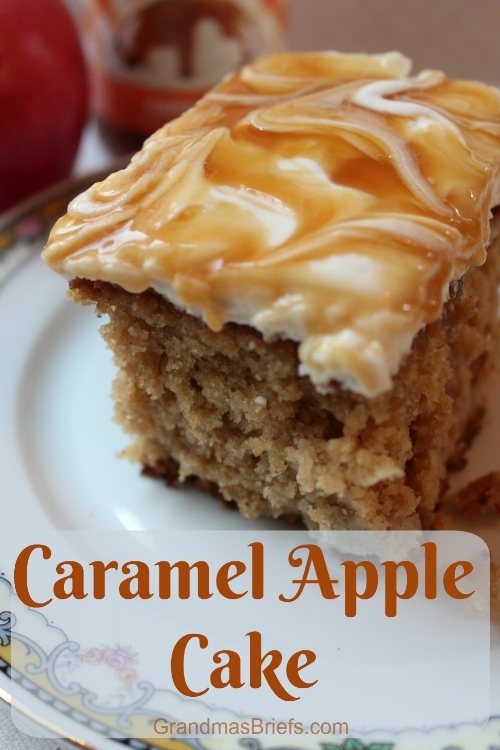 Add apple sauce and caramel; mix well. Add eggs one at a time, beating after each. In a medium bowl, whisk together (by hand) flour, baking powder, baking soda, cinnamon, and salt. With mixer on low, gradually add flour mixture to sugar and oil mixture, alternating with sour milk and beating until just combined. By hand, stir in chopped apples, distributing evenly. Pour into prepared pan, spreading evenly. Bake 45-55 minutes or until cake center springs back and inserted toothpick comes out clean. Let cool on wire rack. Spread Cream Cheese Frosting (below) onto cooled cake, making decorative swirls across top. Using a spoon, drizzle large streams of caramel sauce across top then swirl it about the frosting for a pretty marbled look. Refrigerate until serving (tho do serve soon after frosting so marblization doesn’t get mucked up by sitting). Makes one sweet-as-can-be 9 X 13 cake. Refrigerate leftovers. In medium bowl, beat cream cheese and butter with mixer at medium speed until smooth. Add powdered sugar, a little at a time. Add vanilla and beat at high speed one minute. Use immediately.